food: pork shoulder | eat. drink. fly. for canada day, we kinda went all out. 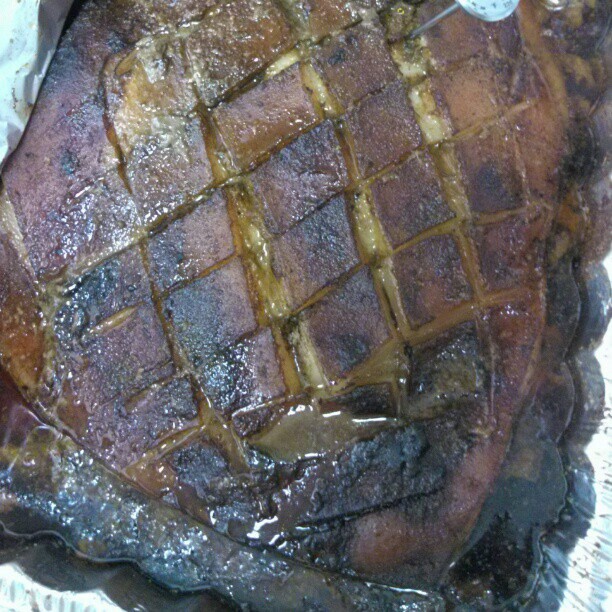 i’m not going to give you a whole lot of preamble, but we slow roasted a 15lb bone-in pork shoulder for 24 hours. 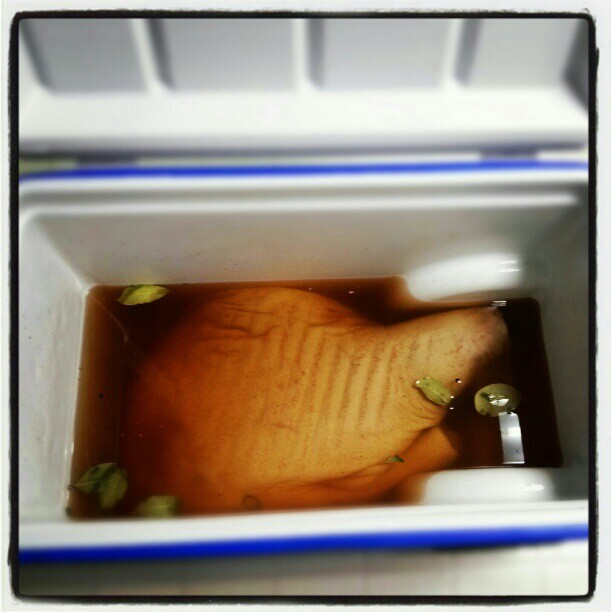 we also let it brine for 24 hours before cooking. 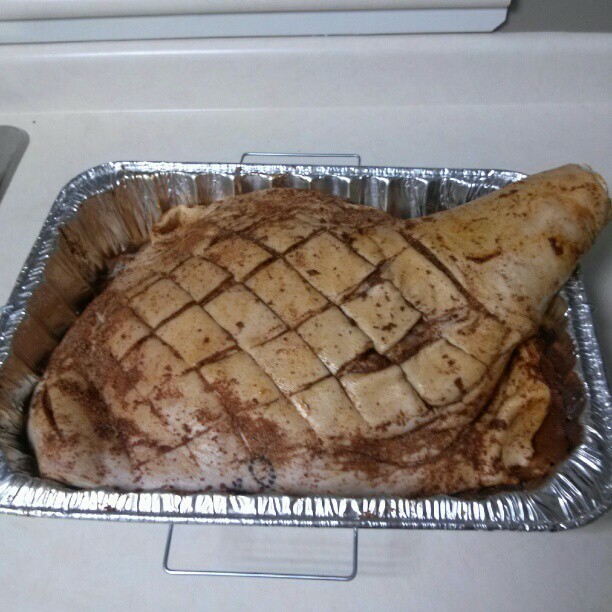 aaaaand we butchered the pig ourselves. so let’s just say it was a real farm to table meal so to speak. 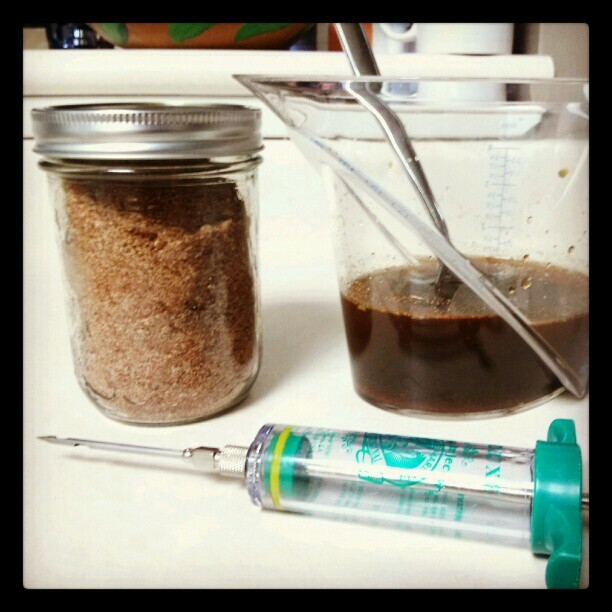 homemade spice rub and injection. 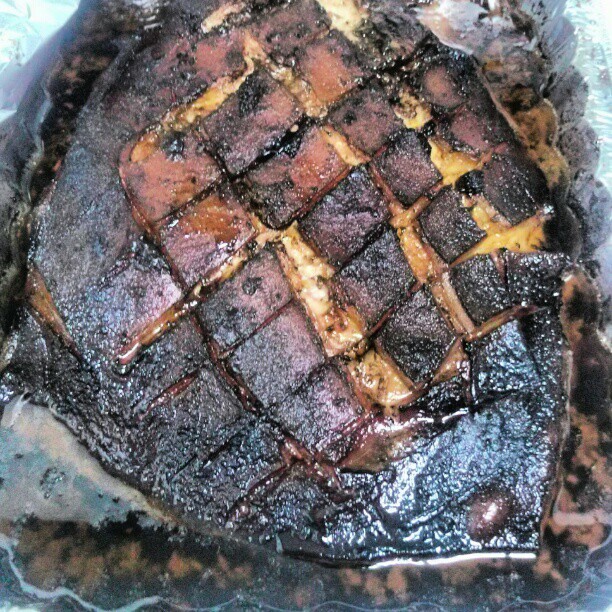 finished product after 24 hours at 200 degrees. 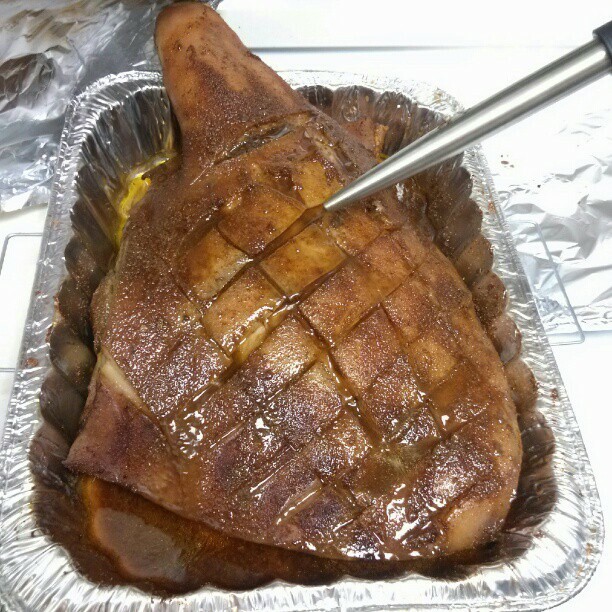 and then we let it cool for an hour and removed the fat cap and shredded the pig into a mountain of deliciousness. we served it up with 3 bbq sauces. a mustard based south carolina sauce. a vinegar north carolina sauce. and a more classic looking kansas city bbq sauce. 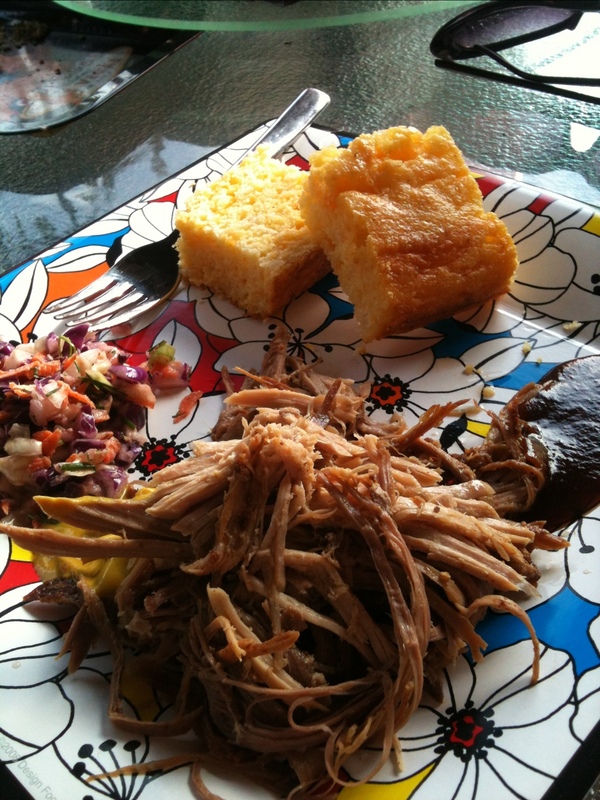 and then we chowed down with some delicious cornbread & coleslaw side dishes. everyone like their bbq different. this first plate is mine. i poured the vinegar sauce all over the pork and then did a side of mustard and classic bbq sauces and dipped as i ate. 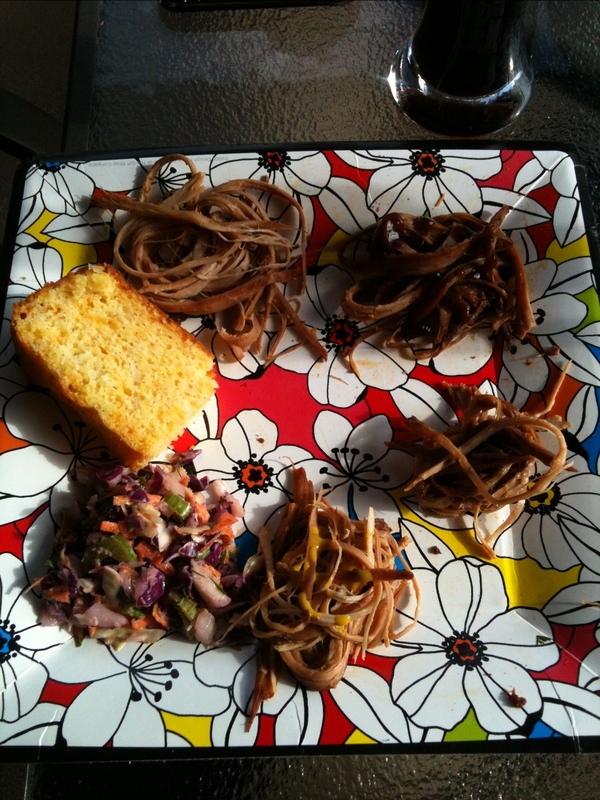 this second plate is moonbeam’s. she made 4 piles, one plain and one with each of the 3 sauces to taste them all appropriately. 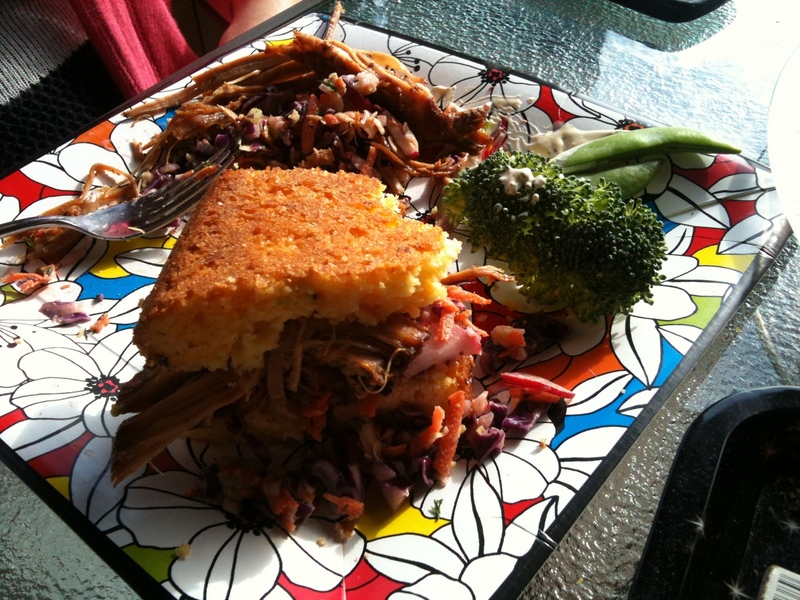 and then jules made hers into a cornbread sandwich. which, frankly, i can’t fault a sister for. the winners were the two homemade sauces, north & south carolina. the bottled sauce was the least favourite even though it was a tasty one. the pork itself was incredible. so tender and roasted to perfection. and as an added bonus, it made my house smell magical for 2 days. it was the first time i’d ever cooked something for that long and wow. what results. part of me was a bit nervous about the whole endeavor… leaving the oven on overnight, what if it overcooked and dried out ect… but it turned out absolutely perfect. and now i shall be eating pork leftovers for the next week. and that is in no way a complaint.